MSE light de-icing equipment is a thermally insulated and electrically heated sprayer unit. The unit is the perfect solution for uncomplicated de-icing of military aircrafts and helicopters but also general aviation aircrafts and small jets. This unit can contain up to 10 litres of de-icing fluid, has a total empty weight of approximately 14 kg and can easily be moved around due to the rubber wheels and handle. Completely built of stainless steel to withstand the most harsh conditions. A 350 watt heating element with built-in thermostat and thermometer ensures the fast and safe heating of the de-icing fluid. A double walled perlite insulated container, guarantees a minimal temperature drop of the preheated fluid. • Heatable up to 60°C. • Pressure gauge – safety valve. • Capacity: 10 litre of de-icing fluid. • 2,5 m hose- 60° circular jet angle. 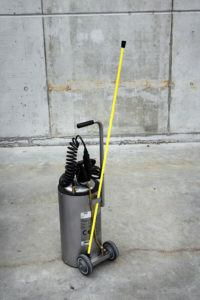 • Spray wand 50 cm (optional: microfiber telescopic lance 1,3 m up to 2 m length). • Empty weight approximately 14 kg. • 220 – 240 V.